Firstly I would like to wish you all a very Happy New Year. Over Christmas I have been working hard to get the odd parts of my suspension cleaned up, sprayed, painted or treated all ready to go back into the car. I have asked Mustang Maniac for some advice at this point. The question was around the new car paint with old untested parts. The simple answer was almost immediate “Easy – replace the major components such as the top and bottom control arms of the suspension”. The reason is that everything bolts to those major parts such as the suspension and steering, so any wear and tear or damage to those critical parts would mean having to take everything back off and replace those components, which in turn could potentially damage the paint with a unnecessary mechanical task that could result from a slip. So, the advice was given and the advice well and truly taken, Thanks Yogi and Adam on that one. 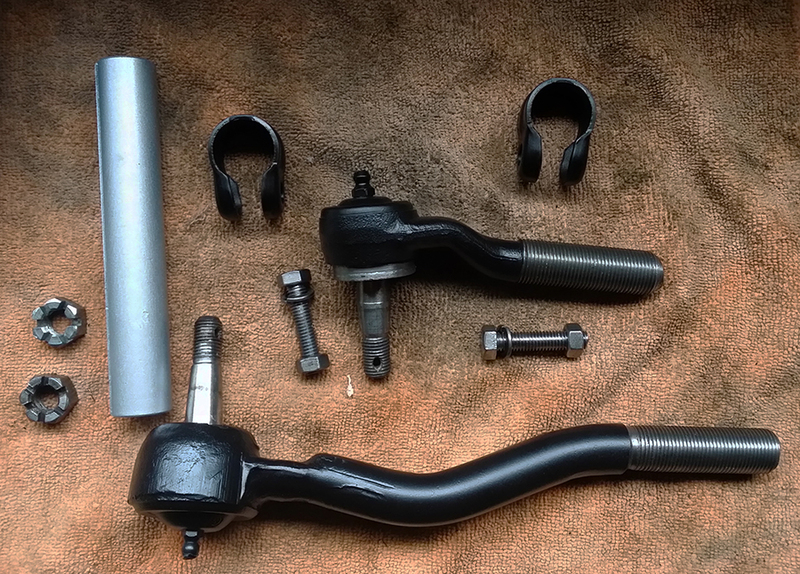 I will replace the top and lower suspension arms, I will refurbish the smaller easy access parts that bolt to it. This would cause much less disruption and you are guaranteed to have tight tolerances where it counts at the very base level. I suppose the analogy scenarios would be the building a house on sand, or making a boat hull out of untreated soft wood. They would look good for a short while but be useless. So what have I been up to? Well that would be the tie rods, ball joints, steering box, spindles etc. Once completed i have wrapped them all up in bubble wrap ready to take down the Mustang Maniac ready to go back on the car. These spindles were seriously gunged up and caked in some serious grime, it took plenty of scraping and wire wheel work to get back down to the original metal. Paint on underseal and paint again that was chipped warranted the work. The final stage was coat of satin underhood black spray to take the shine of the spindles. The steering box needed a bit more work for some contrast work. Again this was pretty rusted up with hardly any protective paint in place, it being the paint was all going to have to come of along with the rust. I could see the original tag on the box and was keen to keep this and see what it said. A good dig around with the various old screw drivers I have to get into all the nooks and crannies that have almost 50 years of grim all over them. With the box back to bare metal and degreased it was time to mask up and get painting. The box was going to be in a semi gloss black with the end cap plate in silver and the bolts in black for some contrast. The completed article looks pretty good with the tag back in place and the silver end cap. The next part of the front end was the tie rods that were well and truly corroded up and seized. I took the left and right hand sides apart which are different in design. The left side was so seized into the adjustment section I had to get my blow lamp out and heat it up red hot and tap it free. It eventually came free and needed a lot of cleaning. each of the ball joints were solid, so they were soaked in Gibbs Brand and tapped on wood to move them. Little by little they started to free up, fresh grease was added and worked free. Left side masked up and sprayed with satin black and silver contrast for detail all ready for assembly. You can see that the adjustment tube is a different design and less substantial. Right side sprayed up ready for assembly. Before I took these apart I carefully measured the positions of each of the track rods in the adjustments. I wound them back into place and only gently nipped them into place. They will need to be adjusted properly when on the car anyway. The finished articles side by side completed. Those of you sharp-eyed will notice the rubber covers are now missing from the ball joints. There is a good reason for that as you can see from the picture. I need new ones! I was going to leave this post on a good high note but it seems that the gravity and little logo I was using is also being used by another company, who I am not going to mention. Not that I wanted to change my identity but I have modified it, and replaced it with my new design. The changes are subtle, colour balance, drop shadows, vignette, more chrome of the pony etc. but, the main difference is that the background colour has gone from a royal blue to a Acapulco blue now the same as my car. Hopefully this now looks a little more antique as it were. There is the copyright now applied to it in white type to show that this is my work and I have also added an invisible watermark hidden within the picture itself. The only trouble is that my YouTube videos will still have the old style on them. Going forward it will be the new style. I intend to change my header at a later date to my car with some fancy photo of some sort. New year and a new logo to go with it? I want to be a different entity to any company out there as this is a unique blog. Should I keep the new design or go back to my old identity? This entry was posted in Blog, Car, Photo's, Polls and tagged avatar, ball joints, copyright, design, ford, gravatar, header, ID tags, logo, Mustang, New Year, One man and his Mustang, paint, poll, rust, rust treatment, seized, Spindles, steering box, suspension arms, Tie Rods, voting poll. Bookmark the permalink. First of all…your New Year is off to a very productive start. There is so much intricacy in the finishing of the parts, bits and pieces if you will 🙂 Also, I have always found it quite amazing that you hold a full time job, bring care and attention to the little lady, and focus on the remaking of a classic. Keep up this steady pace as soon it will be gardening and fix-up time again. LOL. Much admiration from across the pond. Mustangs forever! Hi ya Debbie, thanks for the lovely comment. It is difficult to juggle all the time about sometimes but somehow I manage it. I am lucky with the support from the Mustang Manic guys have have been nothing short of amazing. Gardening is to my cup of tea I I must say. Who knows after this little lady is running another project? That would be nice. Like you say Mustangs forever from the side of the pond too.